DiMarco’s Syracuse Headquarters Expansion Complete | DiMarco, Abiusi & Pascarella CPAs, P.C. The Syracuse headquarters recently welcomed Centerstate CEO Ambassadors congratulating the firm on our office expansion. The award was presented in our media room to firm Partners, Staff and Interns. Centerstate CEO Ambassadors provide recognition to businesses celebrating important milestones. We welcomed the Ambassadors to our Syracuse headquarters to receive recognition and an award that we proudly display. The firms growth in the audit, accounting and tax areas provided the need to expand our office space. Our expanded office space has LED efficient lighting, skylights and a new media room with the latest audio and visual technology. 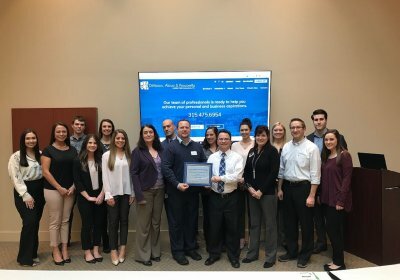 Pictured are Centerstate CEO Ambassadors presenting the award to Carl Greco, CPA along with firm staff and interns.